The cattle industry is hugely benefitting from the wave of new technological advancements. New technology has allowed farmers to become more efficient with their labour and time, have better control over cattle wellbeing and better quality of production. Today, farming technology is impacting all facets of cattle production and handling. Products are being developed to improve the wellbeing of animals and limit the amount of distress caused to them. In 2017, the CSIRO developed a poll gene-marker test that has allowed Aussie farmers to breed Australia’s first generation of hornless cattle. While necessary in the wild, horns on a farm are dangerous and costly as cattle can hurt themselves or others in the vicinity. The CSIRO states that bruising alone costs the beef industry $30 million a year, or $4 per animal at the point of slaughter. Dehorning is a bloody and labour-intensive procedure that has long been a welfare issue within the industry. This test provides a genetic solution that saves money and looks after the welfare of the cattle, eliminating the need for such a procedure altogether. 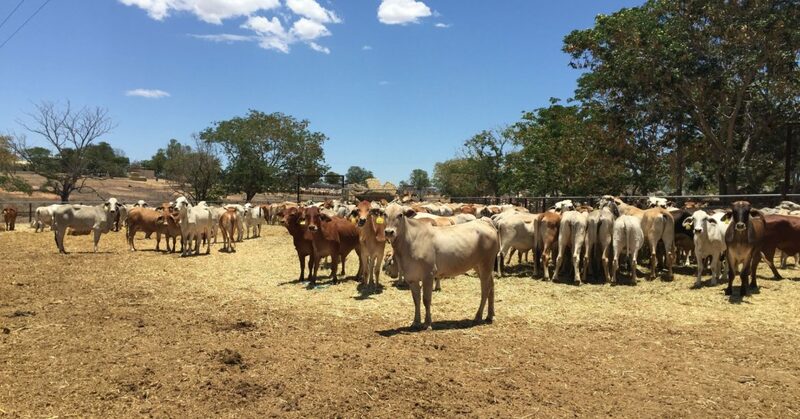 Another new technology in cattle welfare is an electronic tracking ear tag that will help provide data to help graziers manage their livestock and farmland. Currently being developed by the James Cook University (JCU) in Townsville and the Queensland Department of Science, the ear tags will measure the animal’s behaviour, temperature, and more to provide an accurate picture of an animal’s movements across a paddock or farm. Automation is increasingly helping farmers to be more labour-efficient. Every day, farmers need to fetch cows for milking and open gates to new paddocks. Automatic gate timers allow gates to be released through a latch mechanism and allows the voluntary movement of cows to the dairy. The gates can only be opened automatically, not closed. Automation has also extended to milking. In the automated milking system, the cow voluntarily enters the milking shed for milking and is recognised by an electronic responder. Suction cups are then attached to the cow’s udder by a robotic arm and they are removed after milking is finished. The free time this automatic system has created allows farm staff to concentrate on other farm and business management activities. To further increase the efficiency of the milking shed, a computer database can store detailed health, milk production and breeding information on each cow. The computer database uses this information to work out how much to feed the cows and calculate how much it will cost. This information is then fed directly into the automatic milking system. The computer databases can also monitor paddocks and fertiliser use for the farmers. The virtual reality experience has allowed the public to follow the path from ‘paddock to plate’. At the 2018 Beef Australia Expo, Meat and Livestock Australia used virtual reality to try and educate consumers about the beef supply chain. The experience followed an animal on a cattle station being moved into a feedlot, to processing at an abattoir before landing on the plate in a restaurant. This immersive experience is an effective way to address misconceptions about the beef industry. Advancing technology in the cattle industry allows farmers to maximise their time and produce a better product with less waste. Additionally, it allows the public and those in the cattle industry to become closer as prejudice and stereotypes are addressed. Ultimately, technology is allowing the gaps in the industry, and between the industry and the public, to grow smaller.